Colette Patterns is having a Spring and Summer Palette Challenge and those that are interested are making mood boards as a way of organizing their colors and ideas for upcoming sewing projects. I don't know about you, but when I get inspired by color it isn't necessarily JUST from fabrics. I get inspired by colors everywhere! My mood board below shows just that :) Keep in mind, this is based on color only, I'm not saying that I want to sew up the clothing that is featured. I always wonder where people find the gorgeous images they use in their palette (not to mention the photoshop wizardry involved in putting them together).. care to share your secrets? Love it! Such a soft way to step into spring with good ol' pastels! 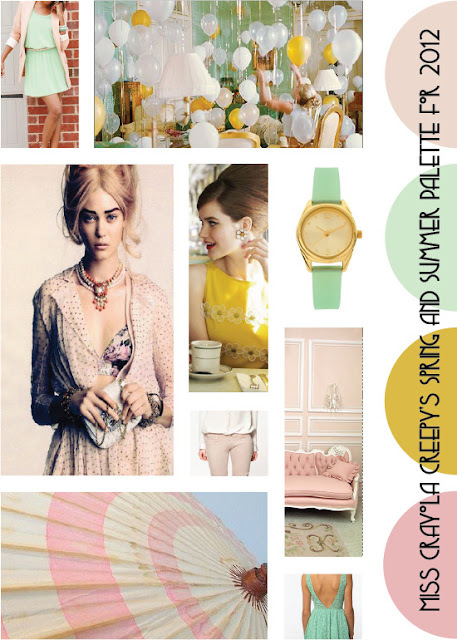 I must also follow on from Johanna above me and ask how do you make your gorgeous mood boards? Hi Amanda! I found my images on Pinterest, one of my favorite websites. The layout is designed in Adobe InDesign. I have a degree in Graphic Communication, so sometimes I nerd out on this stuff. Pretty choices. The colors remind me of sherbet. Yum! Pastels are so fun-- how can you not love them?! The minty green dress in the top left corner is a perfect color! I agree, I love that color! Oh your colors are so dead on for spring!!! I swear these are the colors I go after every year when the weather starts to warm up. Pastels are cliche for a reason...because they ALWAYS say spring!! Beautiful. Thanks, Sallie! Are you going to do the color challenge? I look forward to seeing what you do! Oooooooh! LOVE!! I love, love, love, those colors. Thanks! Red, white, and blue is more awesome though! I love your board and I think the pastels you chose are perfect! It is cliche but I've been very into pastels as well, especially mint green. So is it any surprise I love you color palette. Nope! Love mint! I am even adding mint to a quilt I am working on. Good luck on the challenge.